Over the last few weeks, I have had the incredible pleasure of working with artist and research Joy Lynn Davis, to support her work documenting the theft of stone sculptures of Kathmandu Valley. The theft, which has gone on since 1970s, is quite outrageous. (Though it is heartening that some of the sculptures are making their way back.) In this post, I’ll talk about Joy’s work first, the online inventory of stolen sculptures I have been helping her build, and finally about how Joy turned this online inventory to a beautiful offline gallery display item. 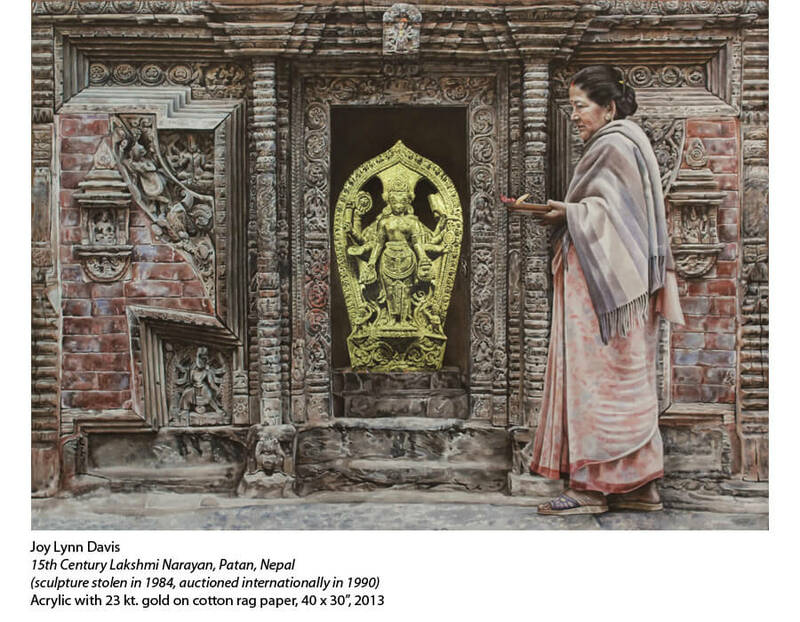 For the last five years, Joy has been meticulously documenting stolen art from Nepal–particularly focusing on stolen stone sculptures from Kathmandu Valley. In doing this, she is picking up from pioneers like Lain Singh Bangdel and Jurgen Shick, who did the documentation in the 70s and 80s, as the thefts were going on, along with many others that have come in the interim. But Joy doesn’t simply document; she is an artist that documents the thefts in such a compelling way that you simply can’t look away. One of Joy’s incredible paintings, from the Remembering the Lost Sculptures series. Joy’s art is beautiful; these screen reproductions barely do them any justice. But it helps me at least describe what she does, which is to create photorealistic paintings that show the sites that the sculptures were stolen from. Into this back-drop, she paints the original sculpture (referencing historical photographs) in gold and black. The images are stunning. The gold draws attention to the missing, hinting of repatriation some day, and the surrounding image puts it in the living, breathing context that the sculpture was stolen from. Often, there are other sculptures that surround the missing one, covered in red tika, still being worshipped by the local community. Others are surrounded by schoolchildren, holy men, guard dogs. I’ve heard many people say that the paintings lose their soul when they are taken from their original places, often the centerpoints for their local community; many of her paintings really convey this sense without words. If you are in (or even visiting) Kathmandu, don’t miss the exhibit, which is up until May 22nd. Each painting takes Joy two to five months complete; she has just over a dozen of these paintings made. However, in her time researching the topic, she has also been tracking a lot more stolen paintings and their stories. A lot of these are drawn from documentation by the likes of Bangdel and Shick (which also provide the historical images for her to paint). But it also includes more recent documentation, including from stories about recent thefts that she has heard from community members when visiting sites of old thefts. When Joy and I got talking after Yantra, she expressed her desire to build an online map and explorable database of the sculpture thefts. I was particularly excited, because what she had been envisioning (an interactive map that the public can explore) is exactly what I build on top of our data collection platform at Ona.io. So I showed Joy what I had been working on, which turned out to be very close to what she needed, and the collaboration began. We are planning to add more data about stolen sculptures to the map as it becomes available. Of course, given the unreliability of everything from the Internet to electricity in Nepal, and Joy’s desire to make as much of the exhibition tactile and physical as possible, we decided not to have the actual online map present at the exhibition. So instead, we decided to build a giant printed map, where we would mark the locations of the thefts with red tika. For thefts which have been located abroad, Joy also used string to draw lines from the site of the original sculpture to where the sculpture ended up. Designing the map for print was both fun and new for me. 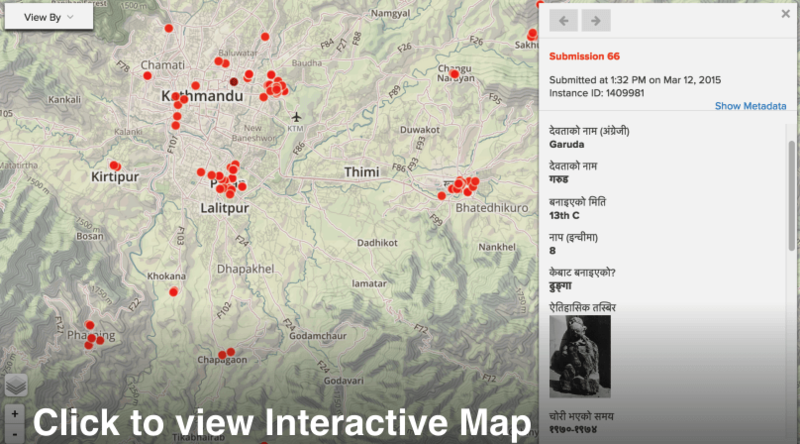 I was glad that we have such rich data in OpenStreetMap in Kathmandu so that I could make such a map. And here, thanks is definitely to the OSM community, largely nurtured by Kathmandu Living Labs. It was most interesting and challenging to make sure that temples, stupas, and other Hindu + Buddhist sites were well represented on the map, but again, the tools from Mapbox and the data from OSM made the job straightforward for me. Enjoy looking at some of the images of exhibit piece below. If you are in Kathmandu, definitely come visit the Exhibition: Remembering the Lost Sculptures of Kathmandu. If not, have a look at the online Inventory of Stolen Sculptures. Red tika: stolen sculptures. Red pushpins: Stolen Sculptures that have been located abroad. Blue Pushpins: Returned Sculptures. Thread: Journey of the Sculpture. Visitor looking at the map of sculpture theft. Visitors looking at the map of sculpture theft.